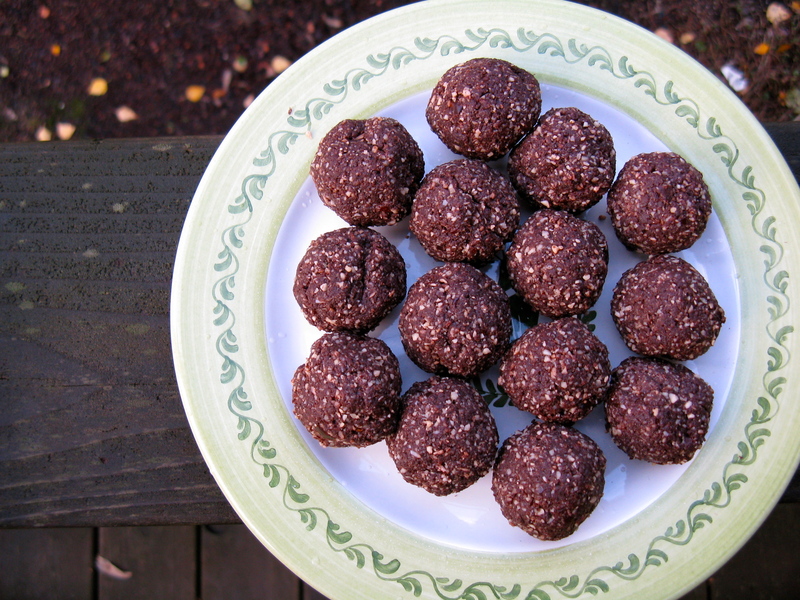 These cocoa mint truffles taste like the holidays — minty and chocolatey. They’re different than your typical truffle — a bit more firm, but they are a tasty holiday treat, and great to bring to a party. In fact, I brought these specifically to take to my friend over the weekend for a get together she hosted. They were a hit and I also decided that they will be my next seasonal flavor at Cultured Caveman, along with my staple, salted almond bites (find my recipe for these HERE). If you don’t have coconut butter on hand, I imagine melted coconut oil will work too. In the food processor, combine the almonds, cocoa powder, coconut and sea salt. Pulse until well combined. Next add the pitted dates, coconut butter and peppermint extract or peppermint essential oil. Blend until well combined. You may need to add half the dates, pulse, and then add the remaining. If needed, add more dates and coconut butter for added stickiness or sweetness. Once everything is mixed together well and there are no large chunks, dump the mixture into a large bowl. (Note: mixture may seem crumbly, but will stick together once you pack it. If it’s still too crumbly, try more dates and/or coconut butter as I mentioned above.). 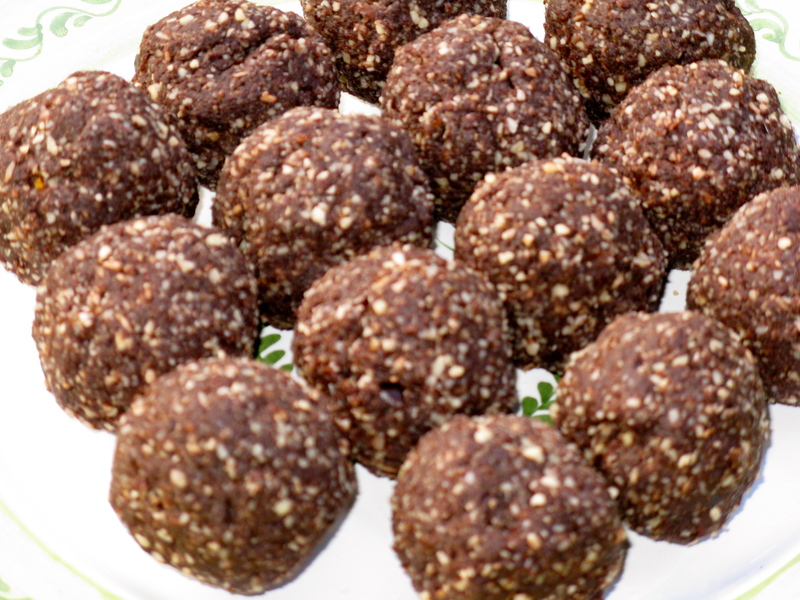 Roll into 1-inch balls (tablespoon-size) and chill in the refrigerator for at least an hour before serving. Alternatively, you can pack the mixture down into an 8×8 pan and cut into squares. These will keep for a 2-3 weeks in the fridge. You can freeze them as well. These were soooooo good!!! Thank you for leaving us with leftovers! And you are totally right about only needing one. It hits that chocolate sweet craving just right, but I don’t feel like pigging out on them cause they are pretty rich. 😉 Thank you for posting the recipe!! Absolutely, Laura! I’m so glad you enjoyed them 🙂 I look forward to seeing you again soon! The only thing peppermint I eat is randomly gum and tea! These look really good though! I’m planning on getting my parents to stock up on dates and try some of your recipes that use them over the holidays! Why do I always forget about the awesomeness of dates?! They’re so versatile and fabulous. These sound amazing, anything with peppermint (great for digestion) is a win! Can’t wait to make them! I love these!! I am going to make some without the dates (eek). I’ll let you know how it goes lol. Thanks! I’m not sure how well it will work because the dates make them stick together, but it may be possible if you add a bunch more coconut butter. Have fun experimenting and keep me posted! Could you use a tablespoon or so of honey or maple syrup instead of the dates to make it sticky? I’m not sure how well it will work, but you could give it a go. I’m sure it’ll work, but may take some experimentation. Are you unable to eat dates? These look great! I love coming up with different truffle flavors to make with dates and nuts. Gotta give this one a try!